I love a dinner made of whole foods! 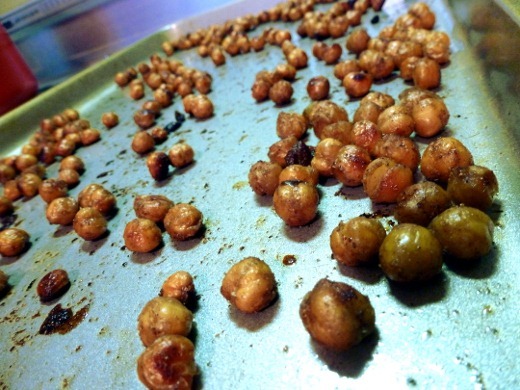 I tried roasting chickpeas for the first time last week, using Not A Leaf’s recipe and method, involving seasoning with brown sugar and lots of garam masala. They turned out great! Smoky, spicy, and sweet, as promised. Also for dinner, I made Martha Stewart’s Honey-Chipotle Turkey Meatballs, which featured more smoky, spicy, and sweet flavors from the honey-chipotle glaze in which these meatballs were tossed. Delicious! And thirdly, asparagus rounds out the meal. I mean, it’s super affordable and especially delicious right now. 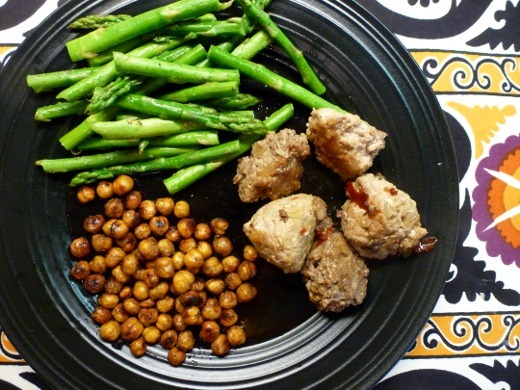 This was a great well-rounded, low carb, nutritious dinner made of whole foods. Yum! Preheat oven to 375 degrees. In a medium bowl, mix together turkey, onion, garlic, salt, and ground pepper until combined (do not overmix). Form into 16 meatballs. In a small bowl, stir together honey, chiles, and vinegar. In a large ovenproof skillet, heat olive oil over medium-high. 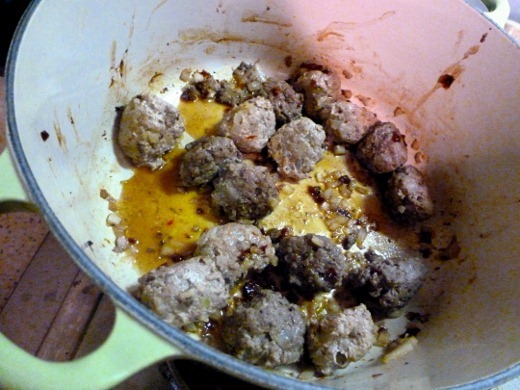 Add meatballs and cook until browned on all sides, 10 to 12 minutes. Transfer skillet to oven and bake 5 minutes. Remove from oven, pour honey mixture over meatballs, and swirl skillet to coat; bake until liquid is reduced and meatballs are glazed, 5 minutes, swirling halfway through. Oh yay! I’m so glad they turned out well!! I still don’t know how to keep them crispy the day after I make them, but hey, at least the day I make them they’re perfect! They WERE perfect the day of cooking – which meant we ate them all that day, which worked out quite nicely, haha. Pingback: Mexican Cornbread Casserole | Meg.Goes.Nom.Nom.